Welcome to Japan. This evening, enjoy your Japanese welcome reception and dinner at your hotel in Tokyo, your Special Stay for four nights. Begin your discovery of Tokyo in Asakusa district, paying your respects at Sensoji, the city’s oldest Buddhist temple. Venture into the stunning scenery of Kawaguchiko Area. Discover the incredible workmanship involved in creating kimonos at the Itchiku Kubota Art Museum. Near Hakone, walk around the hot springs of the Owakudani geothermal area before admiring the stunning scenery during your cable car ride down to your Lake Ashinoko cruise. Walk off your delicious lunch in the East Gardens of the Imperial Palace. Relax in the Green (Business) Class on the Shinkansen train to Himeji Castle and marvel at Japan’s most spectacular, and one of the few remaining original castles. Continue to Hiroshima where tonight you’ll sample Okonomiyaki, a delicious savoury Japanese-style pancake and specialty of the region. You’ll enjoy two nights in Hiroshima. Travel by ferry to Miyajima Island to visit Daisho-in Temple and the floating sixth century Torii Gate at the Itsukushima Shrine. Marvel at industrial robots at work in the Mazda car factory. 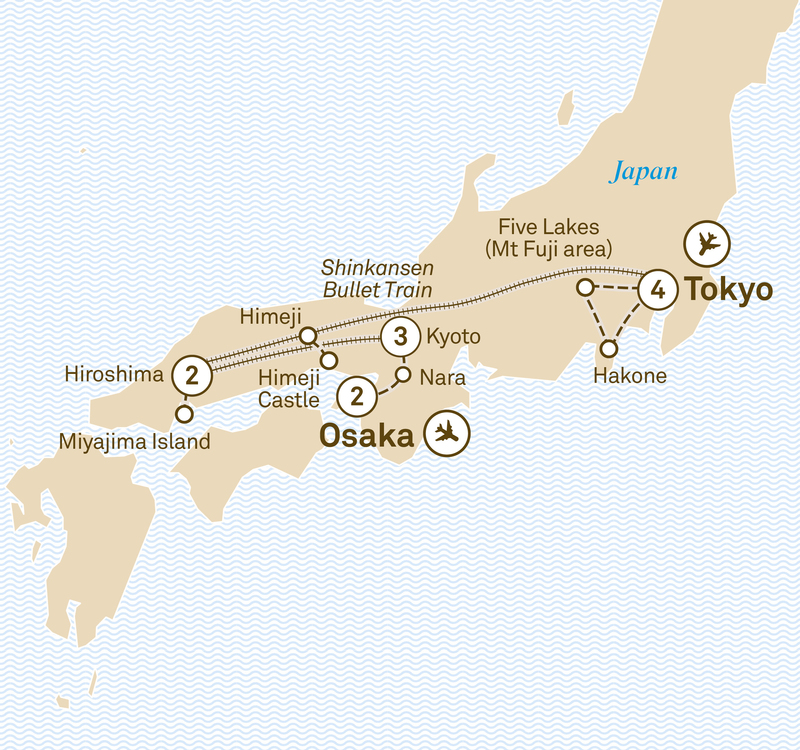 Later, travel by Shinkansen train to the culturally rich city of Kyoto, home to many World Heritage-listed sites. Settle into your three night stay in Kyoto. Revel in the atmosphere of the ancient preservation districts or visit the Silver Pavilion and stroll along the Philosopher’s Walk. Alternatively, visit the Fushimi Inari Shrine, featured in the movie Memoirs of a Geisha and marvel at the architecture of Nijo Castle, a classic reminder of the fascinating Edo-period shogunate’s power. Visit Kinkaku-ji, known as the Golden Pavilion before wandering through the classical Zen Garden at Ryoanji Temple. Stop for some sake tasting at a sake museum. Ryokan Upgrade - For a unique insight into Japanese culture, choose to stay tonight in a Ryokan. This traditional Japanese Inn has tatami mat flooring with futon beds, sliding shoji paper doors, onsen hot spring baths and private facilities. Includes dinner and breakfast. Begin your journey to Osaka with an excursion to Nara, where you’ll visit Todaiji Temple and see deer in Nara Park. Later, stop at the timeless village of Tondabayashi Jinaimachi. Visit a traditional house and wander around this historical time capsule, with houses and buildings that date back to the Edo period. In Osaka enjoy a two night Special Stay. Admire the view from the Floating Garden Observatory and walk the lively and eccentric downtown area of Osaka, or alternatively visit the Museum of History and the rebuilt Osaka Castle. Later, see how beer is made at the Asahi factory, with a taste test, before reliving your experiences at your tonight’s farewell dinner. Depart today with treasured memories of your time in Japan and China.